I feel a niggling guilt about my maintenance of Things. ‘Things’ are not where my energy goes. Creativity, care, creatively caring for people, inspiration, respect, art therapy, cultivating gentleness and kindfulness in the world. These are some of the places and spaces I prefer to focus on, given the chance. The peeling paint wall outside my sweet rented workplayspace is one of those Things calling for attention. Mostly I have a very un-grownup ostrich strategy of filtering it out. Mostly I don’t see…I don’t actively look….at such niggly naggy Things if I can help it. I remembered that I LIKE the look of peeling paint. I have an aesthetic soft spot for images of fading glory, vintage versions of Brighton Pier or grand dame Havana buildings or crumbling palaces. I don’t like the slick, soulless beige-ification of contemporary spaces. 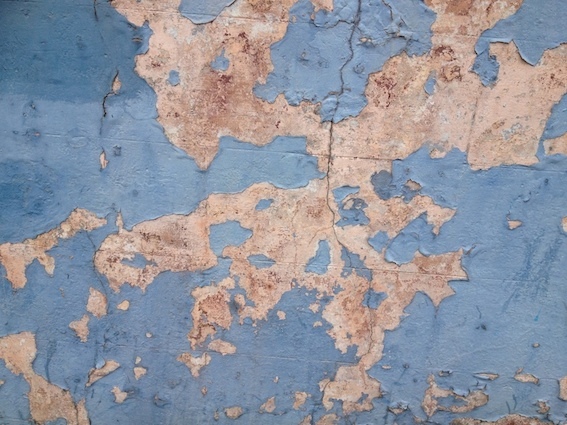 I bring myself to LOOK at the peeling paint wall. I LOOK at it. I SEE it. Does this look eerily like a map to you? It is beautiful, evocative. It is poetry. It looks like a map of the world gone skewiff. Suddenly, I must photograph it and share it. Tell me…tell us…what is a tired-out old something in your world that you can look at with fresh eyes, through Art-Coloured Spectacles? inspired by Peel Map 1 or Peel Map 2? Feel free to share it here as a comment, or use the contact form to send me your poem. It doesn’t have to be any good. Just something from the heart of your eyes. 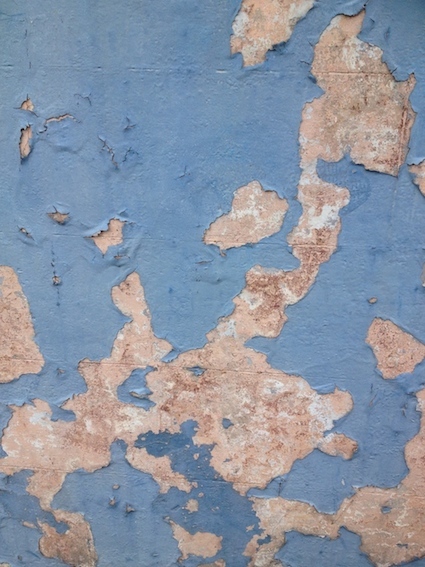 This entry was posted in Artful Challenge, Creative Inspiration and tagged art, art of looking, fresh perspective, inspiration, peeling paint, poetry by Art and Soul Space. Bookmark the permalink. My dad ascribes to this concept and taught it to me, too. Wonderful map ~ I see it too, immediately! Great post!! Thank you, dear SandSaltMoon. I think your dad is a fine dad. Where ‘looking with art eyes’ is even more tricky is when you are on the road stuck in traffic, behind a garbage truck, running late. Now there’s an art challenge. Wow, Ulli, wow. You are an amazement and a glorious golden treasure in the world. Love and gratitude to you. And funnily enough, Ulli, today I was pondering Spiderfly Woman, Dragonfly Woman and my various other mythical hybrid paintings. I love your imaginative sparkle! Held by the blue ocean. Which will rest and be held in my heart. Beautiful, Margot. I love this poem. It helps my thoughts soften. And reminds me to connect with the feeling of being held by the earth and its oceans. I have the sweetest broken teacup a-sitting and a-waiting for some inspired way of refashioning or incorporating it into an artwork. Do you consciously practise wabi sabi, Belinda? umm, not as a practice. i see it as an aesthetic. a way to describe something which is changing, impermanent, touched with a gentle sort of melancholy, and beautiful. there is a sort of serenity to it, an acceptance of what is. but if i have a beautiful broken teacup, yes, I would stay open for a way to use it eventually. I used to work/play with rust a lot, and bones, white-ant eaten bits of wood. and purposefully use bad brushes or bits of twig to apply paint, so that the line was not so sure of itself. not sure if that is wabi sabi, but I think it is in that zen(ish) moment of things, alertness. love that. the line not being so sure of itself. you do have a way with words. and pictures. and philosophies. Really? How ancient? A century? More? C’mon – I’ll bet I’m more parts dinosaur than you are!